From Amsterdam Schiphol Airport there is a direct train (about 5 trains an hour) to Amsterdam Central Station which takes about 18 minutes. Buy the tickets from the ticket machines (yellow with blue writing) or at the ticket counter, which is slightly more expensive. Only the ticketing machines at major stations, including the airport and at Amsterdam Central Station accept Mastercard/Visa at a surcharge of 1 Euro per transaction. All machines accept foreign bank (debit only) cards with a Maestro Logo. Bank notes are not accepted, on some machines coins will be accepted. Many pickpockets are present on and around the trains! Taxi from the airport is around 60 Euro. The official taxis are lined up in front of the airport. The Schiphol Hotel Shuttle links the airport with almost every hotel in Amsterdam for around 17 Euro per person. The cruise terminal is right next to the Movenpick Hotel. Direct international trains run to and from Brussels (connecting with Eurostar trains to London, England), Paris, Cologne, Frankfurt and Berlin and more. For GPS users: Piet Heinkade 27 1019 BR Amsterdam. The ships for river cruises are either docked on the opposite side of the terminal, which makes the walk to town slightly longer. Many are also docked closer to the station. Check here for exact location and map. All other parts of the port see below have no good airport connections and an expensive taxi ride is the only option. If there are more than two ships at the Main Passenger Terminal the VCK Waterland terminal at the Elbaweg 10 will be used, with shuttles in place. This is a industrial port, where Nissan cars and machinery arrive from different factories around the world. There are no facilities here and no public transport. The often free, shuttles will transport you to Sloterdijk station, from where a 10 minute train ride to Central Station in the center of Amsterdam. Check with your cruise line beforehand which services they will offer here. Take your passport along when you disembark, as it will be checked by customs. NOTE: Due to a sudden implemented Tourist Tax in Amsterdam the following cruise lines moved their ships to either Rotterdam or IJmuiden: Costa, Aida cruises, MSC Cruises, Holland America Line, Cunard, P&O en Cruise & Maritime Voyages. Please check your itineraries carefully. Only small cruise ships use the Felison terminal, from which buses will transport you to Amsterdam or other destinations. A "Shanty Chorus" is often present to welcome you or say bye-bye. A Taxi to Amsterdam is about 60 Euro. Public transportation is poor. Use ship provided shuttles/excursions. Started in 2012 larger ships are using the new Felison Cruise Terminal. As it takes at least 2 to 3 hours to sail from IJmuiden through the locks to Amsterdam, you will actually have more time for sightseeing as the driving time is only 60 minutes. This terminal is located in an industrial area, however within walking distance to a large marina with a Holiday Inn hotel and several so-so restaurants and outdoor cafes. A little further is the wide beach with many outdoor cafe's and restaurants and can be very enjoyable on a nice day. The bus stop ( #82 every 30 minutes) is only a few minutes walk away. When you exit the terminal take the steps across the terminal. You will have to negotiate some (20) steps up and down. The bus stop is right there. You can buy the tickets from the driver. Bus 82 goes to Amsterdam Sloterdijk station, from where you can take the train, trams or bus 22 (since buses are included in the day ticket and trains are not) to Amsterdam Central (Every 10 minutes). This bus also at times continues to the Marnixstraat, which is close to the city center and Anne Frank House. Check https://9292.nl/en and fill in Badweg IJmuiden to Amsterdam Centraal. The total cost, bus and train one way is about 6.50 Euro. You can also buy Amsterdam & Region Day ticket for €13.50, which is for all public transport except trains. You can obtain these tickets in the cruise terminal and buses are plenty when cruise ships are in port. Cruise companies in general offer shuttles to Amsterdam at around 23 Euro a person. By car: Type: Zeehavenweg IJmuiden on your GPS. If taxis are available you also can take one to Driehuis Train Station and from there take a direct train to Amsterdam (every 30 minutes). IJmuiden itself does not have much to offer as far as sightseeing is concerned. From Schiphol Airport to IJmuiden with light luggage: take the train from the airport to Amsterdam Sloterdijk Station (almost every 10 minutes) and take bus 82 (every half an hour) to the terminal. One piece of advice if you take a cab (expensive): Tell the driver to go to the Zeehavenweg, as this facility is new, and most cabbies are not aware of its existence. Please note: Take your passport along when you disembark, as it will be checked by customs. Many hotels around the Airport offer Fly & Park deals, which is a good option as parking in the city is very expensive. Check here for festivals and events in Amsterdam when you are in port. Meaning: Dam in the Amstel River. Amsterdam is a beloved tourist destination for new and old visitors alike. With its vast cultural inheritance, it is a popular destination for cruise ships. Visiting Amsterdam remains a unique experience, just like a cruise. The historical city center is a world heritage site and compact living museum where everything is within walking distance, from the diamond cutters to the world famous museums and art galleries. And Amsterdam outside the ' canal ring' also offers fascinating sights, beautiful excursions and rich history. Tickets for the Anne Frank Museum can be bought online. Lines to get in can be very long. An alternative can be: Our Lord in the Attic which is one of the oldest and most remarkable museums in Amsterdam. On 30 April 2013, on Queen's Day, Prince Willem-Alexander succeeded his mother Beatrix in Amsterdam and became King of the Netherlands. Consequently, from 2014 onwards the name has been changed from Queen's Day into King's Day. Also, the date has been changed from 30 April to 27 April, which is the birthday of Willem-Alexander. If you are visiting Amsterdam then a canal cruise is an absolute 'must'! Cruising along the canals is a real journey of discovery. Many cruise boat operators will take you on an hour-and-a-quarter trip past the stately canal houses, the colorful houseboats, the canal with seven arched bridges, the Dutch East Indies Company replica ship and much more. Besides enjoying the cruise, you will also have the best view of all the splendid sights that Amsterdam has to offer. In front of the central station you will find many canal cruise companies, all around 10 euro for a tour. With the I Amsterdam Card you get use of public transport for 24, 48 or 72 hrs including trams, buses and underground of the GVB public transport system. Important: not valid for train travel, including to and from Schiphol Airport. If you only be in Amsterdam for a few hours the card seems expensive. Some bike rentals and some tips for safe biking. You probably do not have to use public transportation in front of the Central Station. If you do (inclement weather or difficulties with walking) just buy the ticket from the driver (bus) or from the ticket checker (tram) or ticket machine (metro). It is a little more expensive, but a lot less hassle. 2.60 Euro for a one hour card, 7 Euro for a day card. Important do not forget to check in and out, otherwise your ticket will become useless. These tickets are only valid on transport with the GVB logo and not on trains and other bus companies. If you are arriving in IJmuiden: The cheapest way to get to Amsterdam city center: Take bus 82 right across the terminal (see above) and get off at Amsterdam Sloterdijk Station, from which every 10 minutes a 5-minute train ride will get you into the center of Amsterdam. Or take bus #75 also at the same spot, which will take you to Haarlem Central Station, from which every 15 minutes a train leaves for Amsterdam Central Station. So take the first bus you will encounter and take it from there. Total cost about 10 Euro return, traveling time about 45 minutes total each way. Tickets on board the bus are sold by the driver. Tickets for the train are sold in the ticket booth. The world-famous fishing villages of Volendam (bus 110 or 118) and Marken (bus 111) - on the coast of the former Zuiderzee (now called IJsselmeer). With its wooden houses and locals wearing their colorful style of dress. The Marken Express boat connects Volendam with Marken and vice versa with every 30/45 min daily daytime departures. In springtime: nowhere else in the world are the flowers and colors of the spring as glorious as at the Keukenhof. The Zaanse Schans is a delightful old hamlet on the banks of the river Zaan with characteristic green wooden houses, charming stylized gardens, small hump-backed bridges, tradesmen's workshops, historic windmills and engaging little shops. This enchanting hamlet gives an excellent impression of how a typical Zaanse village must have looked like in the seventeenth and eighteenth centuries. Apart from the cluster of windmills and houses, there are also several museums, restaurants and a visitors' center to be found as well as the possibility of taking a boat trip on the river. The Zaanse Schans has become one of the top tourist destinations in the Netherlands. Haarlem, With its ancient buildings, cobbled streets and winding waterways, the medieval city of Haarlem is one of the most photogenic destinations in the Netherlands. Easily reachable by train (just fifteen minutes from Amsterdam Central Station) Haarlem is often referred to as a scaled-down version of its more famous neighbor. Kalverstraat is the longest shopping street in Amsterdam. 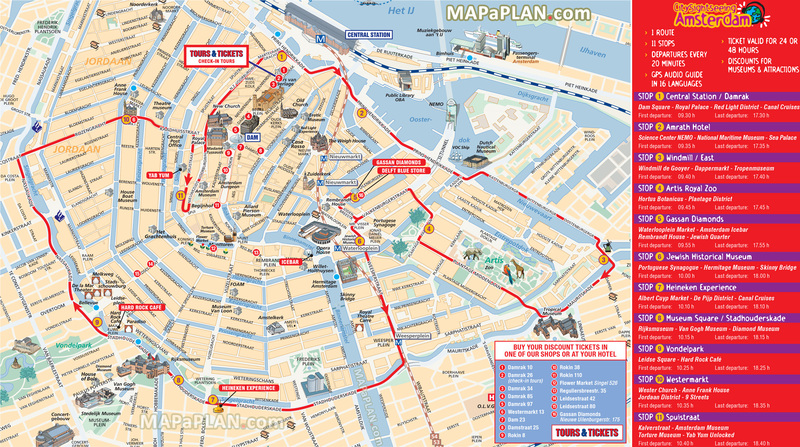 It starts at Dam square and goes all the way to the Muntplein. When you turn right at Heiligeweg, you'll find some more exclusive shops, (at the end on Koningsplein at your left: Amsterdam's famous floating flower market and more when you continue straight on Leidsestraat, which will lead you to Leidseplein. If you're feeling rich or simply want to feast your eyes on lovely things (fashion, antiques, and art), begin at the Concertgebouw (Concerthall) and walk (northwest) along Van Baerlestraat toward Vondelpark. Turn right onto elegant PC Hooftstraat. At the end of the street, by the canal, turn right again and walk to the Rijksmuseum, then turn left across the canal. Straight ahead is Spiegelgracht, a small and quiet bit of canal that's the gateway to the best antiques-shop street in Amsterdam, Nieuwe Spiegelstraat. With such an international population, Amsterdam offers restaurants and cafés with everything from genuine Indonesian food to Mediterranean tapas. A very popular snack is a kroket which consists of a thick ragout, shaped into a cylinder of about 10 cm in length and 4 cm thick, rolled in breadcrumbs and deep-fried. They are usually made from beef or veal. Even McDonalds serves a MacKroket. Don't forget to taste the herring: raw with some onions! Important things to know about the Netherlands, like tipping, toilets etc. Euros are divided into 100 cents. There are coins of 1, 2, 5, 10, 20 and 50 cents, and 1 and 2 euros. There are notes of 5, 10, 20, 50, 100, 200 and 500 euros (note the pattern 1, 2, 5). Some shops do not accept large denomination notes, and many don't like the 1 and 2 cent coins, and so round cash amounts to the nearest 5 cents. Credit cards are not as widely accepted in the Netherlands as in many other countries because of the high fees retailers have to pay. Always enquire first if you want to pay by credit card. Cash is preferred. Public transportation does not accept credit cards! Just about everyone speaks English in Amsterdam, and is proud of the fact. Many speak German and French too. If you are English speaking, speak English (unless you speak Dutch too): you are more likely to offend than do anyone a favor by trying out your French or German. A common misconception is that Dutch is very close to German. In truth they are not mutually intelligible: Dutch people have to learn German at school, and in general they speak better English than German. German and Dutch are similar in the same sort of way that French and Italian are similar. Free Wifi in the Amsterdam cruise terminal. Get login and password from the reception desk in the terminal. At port side on the ship you will have a good connection on the promenade deck. Also free Wifi at the Felison Cruise terminal. Login details are displayed at the monitors in the terminal. In general, shop-opening hours are 1-6pm on Mondays and 9/10am-6pm Tuesday to Friday. Most have late night shopping on Thursday until 9pm, and close earlier on Saturdays, at 5pm. Some supermarkets, like Albert Heijn, stay open until 8 or 10 pm. On Sundays, you can shop in the city center, Kalverstraat, Damrak, Leidsestraat, and near the Noorderkerk. King's Day - April 27. Amsterdam is one giant party, not to be missed. Christmas Day (December 25) and Boxing Day (December 26). In addition, there are two World War II Remembrance Days, neither of which is an official holiday, though some establishments close. May 4 honors all those who died in the war, May 5 celebrates the Liberation.